A recent hoard find means hoard savings! Own the last King George V £1 note ‐ in premium grade! Secure yours today in stunning Extremely Fine grade ‐ click 'add to cart' now! Thanks to a recent hoard find, Downies is delighted to offer you an utterly mouth-watering opportunity. Here is your chance to secure the last King George V £1 note issue in premium condition ‐ at way below market price! The historic 1933 £1 Riddle/Sheehan banknote is a genuine artefact of the Great Depression. Living proof of the economic turmoil that engulfed Australia, this was the first £1 issued after the Gold Standard was abandoned. No longer 'backed by gold', this note was the first of the 'Legal Tender Series'. Generally scarce, the 1933 £1 Riddle/Sheehan was issued in limited numbers to accommodate a small Australian population. The low denomination £1 also had a high circulation rate, and was, on average, withdrawn from circulation after 15 months. As a result, the last George V £1 can be tough to find in premium grade ‐ and often very expensive. It is the outstanding quality of the notes before you that makes this opportunity so exciting. It is the price that makes it so irresistible! 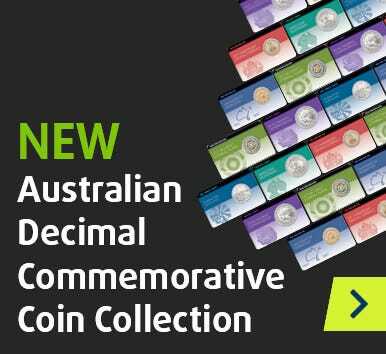 Found in premium-grade Extremely Fine condition, we can offer each of these landmark predecimal notes at $995 ‐ that's over $400 off the market price! Don't miss this critical opportunity! Click 'add to cart' now to secure your 1933 £1 Riddle/Sheehan banknote.